I have to say three cheers to vodafone. I have previously posted about not being able to use my 3G USB modem with Ubuntu. 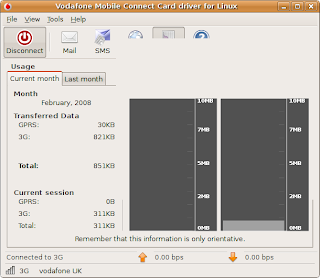 Well vodafone do offer a GUI that works under linux for connecting using their 3G USB modem. Nice comments for the Connect Drivers. Thanks! Kind regards, Nicholas Herriot from Betavine. cant get to the site u quoted.. gets 404 error.. please check site address, thank you . Hi, I asked Vodafone to lower my price plan as I couldn't afford to pay the full amount. They all just said there is nothing they could do and told me to wait it out. I now have 5 months left on my price plan. I went to Vodafone and asked to cancel and again they said there is nothing they could do. I asked to lower my price plan and still no help at all. Lowering your price plan after 12 months is a service every other phone provider offers! So there is nothing I can do but wanted to tell everyone how useless they are and not to use them. I will wait it out till the en of my contract but will never ever use them or recommend to anyone. Rant over! CuteRimi - Your vodafone comment is of interest, but not the link, hence removed.